This miniature version of the ever-popular coconut cream pie dessert recipe features a creamy coconut filling topped with toasted coconut. Bake tart shells as directed on package; cool completely. Meanwhile, beat pudding mix and milk in medium bowl with whisk 2 min. Stir in extract and Cool Whip. Refrigerate 15 min. 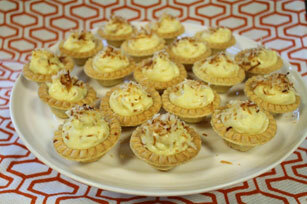 Spoon pudding mixture into tart shells just before serving; top with toasted coconut. Preheat oven to 350°F. Spread coconut in shallow baking pan. Bake 7 to 10 min. or until lightly browned, stirring frequently. Or, spread in microwaveable pie plate. Microwave on HIGH 3 min. or until lightly browned, stirring every minute.